It looks like CBS wants to send Detectives Mike Stone and Steve Keller back to The Streets of San Francisco, albeit without the show’s original stars. 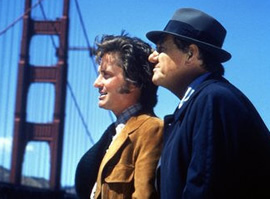 The Streets of San Francisco debuted on September 16, 1972 on ABC. The series follows veteran detective Mike Stone (Karl Malden) as he is partnered with a rookie and recent college graduate, Steve Keller (Michael Douglas). Over time, Keller learns the ropes and is promoted. Towards the end of the series’ five year run, Keller leaves the force to become a professor at a local college and Stone is partnered with another young detective, Dan Robbins (Richard Hatch). Malden won four Emmys for the series while Douglas took home three. The show ended its run on June 23, 1977. On January 27, 1992, NBC aired the Back to the Streets of San Francisco TV movie. Malden returned to his iconic role as Stone, now Captain of Inspectors. His old partner Keller goes missing and Stone suspects foul play. At the same time, Mike must decide which of two very different lieutenants he should recommend for a promotion. The movie ranked respectably in the ratings but there wasn’t a follow-up. Now, over 30 years after the ABC series went off the air, CBS is hoping that a remake of the series will attract viewers, particularly those too young to have seen the original. Numb3rs producer Robert Port and screenwriter Sheldon Turner have been working on modernizing the concept since January. Port is a certified member of the LA County Sheriff’s Department and the duo have spent time in the Bay area, riding with San Francisco cops for research. CBS has commissioned the pair to write a script and if a pilot is ordered, Simon West will direct. West has a deal with CBS Paramount TV and will executive produce along with Jib Polhemus, Port and West’s producing partner. CBS Paramount TV owns the rights to the original Quinn Martin Productions series. Are you interested in a new version of TSOSF? Nah. Who needs another cop show? If the new Streets of San Francisco actually becomes a series, will viewers be interested in taking a trip back to the City by the Bay with a new Stone and Keller? Stay tuned! I’m posting this in 2011. It’s almost Christmas. I wonder how far they’re coming along with the revival, if they’re really serious about it. Not only would it bring some excitement and energy into the SF Bay Area, but also much needed business. Back in the 70’s, they even let locals onto the show for walk-on roles and to play as extras. I, for one, would love to be immortalized (credited or not) by appearing in even just one episode…. which may even end up on DVD/BluRay someday afterwards! There will never be another “Streets …” like the original. Malden and Douglas were an ideal coupling for their roles – notice how it went down the tubes when Michael Douglas left. Richard Hatch just couldn’t fill Douglas’ shoes. It would cool to see The Streets of San Francisco revived, but if by any chance it will, the show better be filmed within the city itself like the original series and not be hollywood-ize! I moved to the U. S. from Israel in 1974 and loved The Streets of San Francisco show. I would love to see a remake. Love the old show.. though nobody could replace Malden and Douglas. Acting will be paramount as the new actors have HUGE shoes to fill. Again the new show must not diverge from the original gritty style of the old show format.. or else it will fail miserably like many of the shows out there. Unfortunately for TV today, shows cheapen themselves to attempt so semblance of a storyline which ends up being as bad as Pamela Anderson in ‘Barbed Wire’. I have faith that you won’t mess this up, buddy boy. Don’t forget car chases! and chasing bad guys on the rooftoops! But don’t forget good scripts! I’ve watched the first two seasons so far on dvd, and the writing on the shows have varied between great to down right compelling. i think most fans of cop dramas would welcome a new sosf, but remember to keep it Gritty! DO IT! One of the better tv shows! Bring it back CBS!